We’re obsessed with style (yours & ours! ), but we also love a spotless closet. We know—it’s not easy to get rid of clothes, but think of it as making more space for pieces that fit you better, feel amazing and better reflect your personal style goals. Having an organized closet also cuts down on the time it takes you to get ready in the morning (more Zzzzzs for you!). Start 2019 out on the right foot and learn how to clean out your closet to invite more style in. Sometime before the Big Clean Out Day arrives, collect a few things you’ll need (including a friend to help with some tough love for those questionable items). Try to avoid throwing clothes in the trash. Donate anything that’s clean and hole/tear/stain free to a women’s shelter or non-profit secondhand store of your choice. Things that are not in good enough shape to be worn can often be cut up for household cloths or even composted, if they’re made from a natural fiber. Decide on the day you’ll be re-organizing in advance, and mark your calendar—that way, you won’t be tempted to reschedule for brunch or lounging on your couch. Carve out at least half a day (plan a full 8 hours if you’re a real clotheshorse). You’ll need food breaks and maybe a little fresh air, depending on the scope of your project. Do you have a friend who’s also a shopping buddy? If so, try to get them to help you with this project. You’ll need someone to help you be decisive, knows your lifestyle and what you need to wear for it, and can help you stay strong when making those difficult decisions (keep the poofy prom dress for sentimental reasons, or make room for 3 pencil skirts and 2 button downs?). Make sure to keep them happy with caffeine and a takeaway lunch. Some find this part difficult, others find it, well, cleansing. Whichever spectrum you fall within, you can’t do the organizing part without purging the stuff you no longer wear. When you’re rushing in the morning (or getting ready for a date night), you don’t want to be rifling through pieces you’d never wear. At the end of this process, your closet will ideally only be filled with pieces that are stain-and-tear-free, fit you really well and look great with lots of other things you own. Does it make me feel great? Do I love the way I look wearing it? Does it go with lots of my other all-stars? You wouldn’t keep a friend around who made you feel bad, so why keep a skirt with a baggy seat, a stained top, or jeans from the 90s? Sure, it’s OK to hold on to the occasional item for sentimental reasons, but for the most part. If it’s in need of repair or only exists to make you look schlubby around the house. 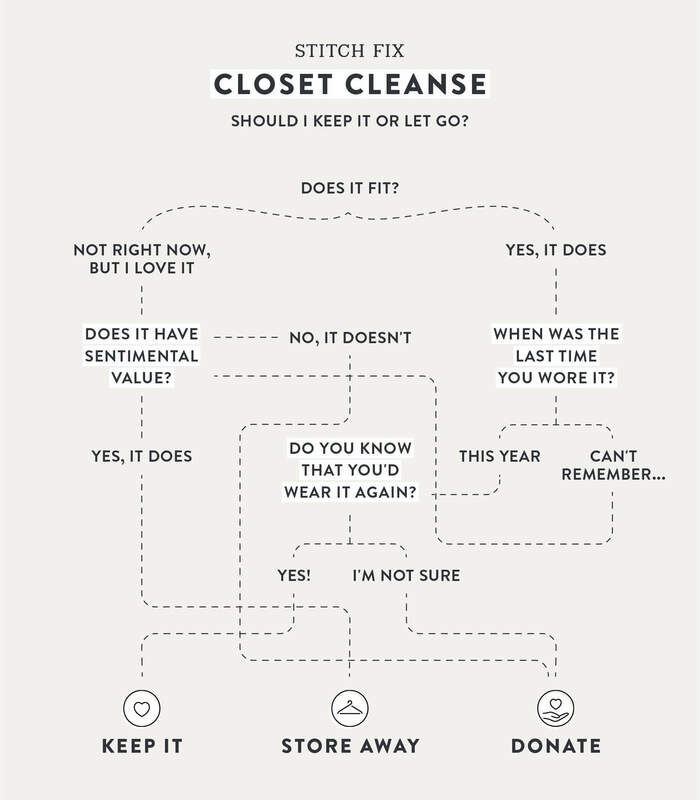 Are you ready to reach closet nirvana? Now is the time to channel your inner interior design diva, and organize your closet into a picture-perfect fantasy. (Or just, you know, arrange things so they stay neat and you can find them.) When organizing, find inspo wherever you like—but see our basic tips to start out. Divide your clothes into categories to save time when getting ready. First separate by type (layering tanks, tops by sleeve length, skirts, shorts, pants, dresses, sweaters, and coats) and then by color (light to dark). Excessive? It’s not! Put in the extra effort to save time in the long run. 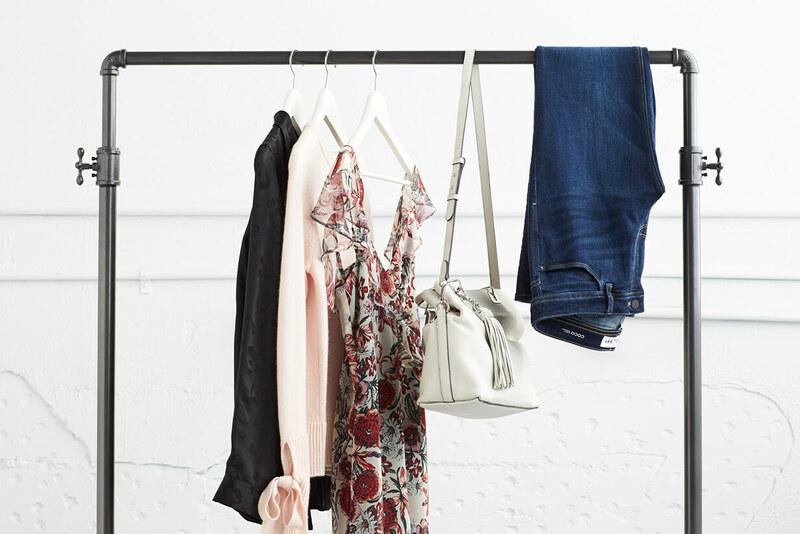 Invest in slim, non-slip hangers for your tops, bottoms and coats. Then, arrange everything so it faces the same direction. This not only saves space, it gives you an overview of what you have. It also gives your wardrobe a clean, color-focused look that’s 100% social-media worthy. If you find you can’t hang everything, spend some time schooling yourself in the art of folding, and store easily foldable items like sweaters on shelving. To keep your shelves organized throughout the year, learn how to fold for optimum space-saving—it makes all the difference. If you have enough shelf space for bins, they are great for corralling smaller items like underwear, socks and scarves. Lucky enough to have built in drawers in your closet (or a dresser)? While it’s fine (even advisable) to use drawers for socks, underwear and t-shirts, with a little imagination you can use drawers for storing jewelry and other accessories. Look for actual jewelry organizing trays, or get crafty and nestle small, open-top boxes together in a drawer to hold your favorite baubles, belts and beads. Now that your closet is organized, schedule a Fix for new clothes to fill your clean closet with!